Dark matter makes up nearly 80 percent of all matter in the universe, yet its nature has eluded scientists. Scientists theorize that it could take the form of a subatomic particle, and one possible candidate comes in the form of a small, theoretical particle called the axion. If it exists, the axion will interact incredibly weakly with matter, so detecting one requires an incredibly sensitive detector. Fermilab scientist Daniel Bowring is planning to build just such an instrument. 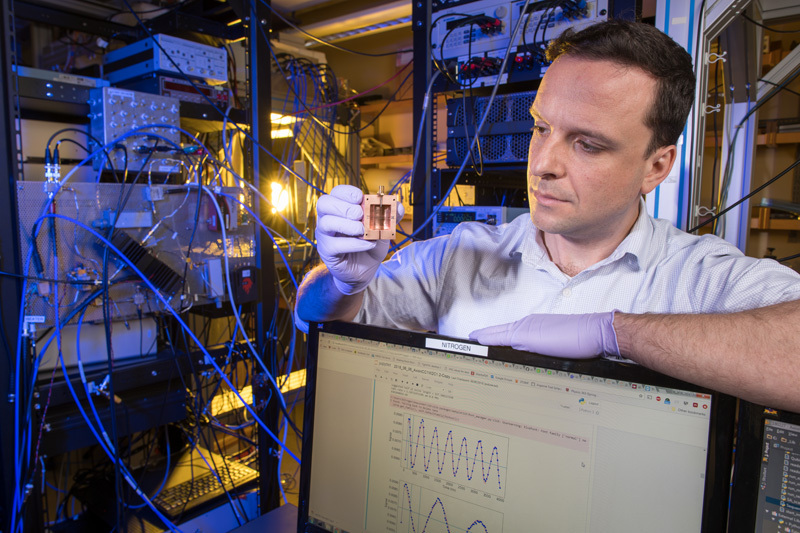 The Department of Energy has selected Bowring for a 2018 Early Career Research Award to build a detector that would ferret out the hypothesized particle. He will receive $2.5 million over five years to build and operate his experiment. The award funds equipment, engineers, technicians and a postdoctoral researcher. “We are very motivated to find the axion because it would solve several interesting problems for us in the particle physics community,” Bowring said. Not only would the axion’s discovery explain, at least in part, the nature of dark matter, it could also solve the strong CP problem, a long-standing thorn in the side of theoretical physics models. The strong CP problem is an inconsistency in particle physics. Particles behave differently from their mirror-reversed, antimatter counterparts — at least, they do under the influence of the electromagnetic force and the weak nuclear force (which governs nuclear decay). But under the influence of the strong force (which holds matter together), particles and their mirror-image antiparticles behave similarly. Or, in physics speak, they’re CP-symmetric under the strong force. (CP stands for charge-parity. It’s the property that’s flipped when you take a mirror image of a particle’s antimatter partner.) Why is the strong force the exception? One potential answer lies in the existence of the axion. In the math of strong interactions, the addition of the axion enables theoretical models to reflect the reality of strong-force CP symmetry. Bowring is following the axion math where it leads — to the construction of a device that can pick up the signal of the fundamental particle, whose mass is predicted to be vanishingly small, between 1 billion and 1 trillion times smaller than an electron. One way to look for the axion is to look for light: In the presence of a strong electromagnetic field — Bowring’s experiment will use about 14 Tesla, or roughly 10 times stronger than an MRI magnet — an axion should convert into a single particle of light, called a photon, which is more easily observed. “Physicists have gotten pretty good at detecting photons over the years,” Bowring said. When an axion enters the detector filled with the electromagnetic field, the particle will spontaneously convert into a photon with a specific frequency. The frequency corresponds to the axion’s mass, so scientists can measure the axion mass indirectly, thanks to the detection of particles of light. Much like someone tuning a sensitive AM radio, researchers will scan slowly through the relevant range of photon frequencies until they pick up a signal, which would point to the presence of an axion. It’s a subtle business, one that requires being able to detect single photons. While photon detection is an old hat for physicists, discerning a lone photon amid the experimental noise of a particle detector is a job for new technology. Bowring’s experiment will use supersensitive, superconducting quantum bits, or qubits, to pluck the solo photon signal from the noise and thus accurately count the number of detected photons. Bowring’s experiment will be an opportunity to bridge the gap between particle physics and the science behind quantum computing. In that respect, the application of technologies in their infancy to century-old problems is a reflection of the larger scientific field.